Hikers, boaters, cyclists and campers rely on backpacks to keep their personal belongings safe and dry. If the backpack is lacking in any aspect, it will fail at its job. Most hikers are not willing to take these risks, so they chose to invest in the Salomon Trail 20 Backpack. The backpack features a large spacious compartment, zippered pockets, handy shoulder strap and so much more. When you are hiking long distances in the hot summer months, you will need to have quick and easy access to your water bottle. To ensure this access, the Salomon Trail 20 is equipped with a water bottle holder, which is conveniently located within hand’s reach. This feature will definitely come in handy for those who refuse to put their hike on pause just to get a drink of fresh water. 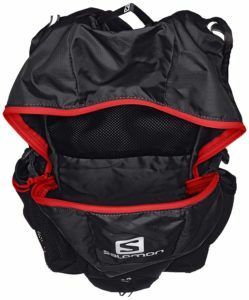 The Salomon Trail 20 Backpack is designed from mesh and nylon materials, which offer both durability and waterproof protection. These materials are also extremely lightweight, so you will not feel burdened down with more weight than necessary. The nylon material will also feel great against your body and never cause skin irritation. The backpack when empty only weighs 13.47 ounces. 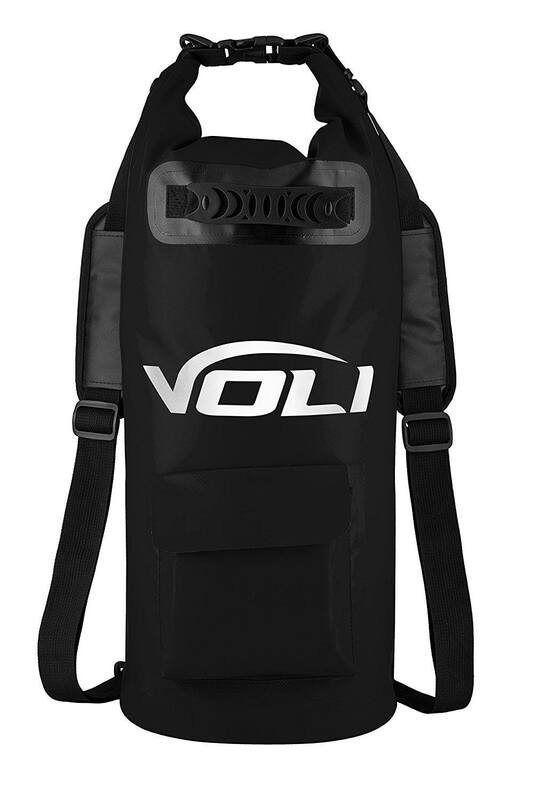 The bladder compartment is designed specifically to hold the Salomon SS16 Soft Reservoir. With a two liter holding capacity, you will not need to fill up more than once or twice throughout your hiking trip. The compartment gives you quick and easy access to the bite valve, while also keeping it secure and clean when not in use. The bladder compartment also includes a hanging system to keep the reservoir secure at all times. This will also help the water drain freely from the bite valve. Unfortunately, not every individual is created of the same height, weight, and girth, which can make shopping for backpacks and clothes a little difficult,but we did reviews of various backpacks so you can find easier what fits your needs. However, thanks to the unique and innovative shoulder strap design of the Salomon Trail 20 Backpack, your size won’t really matter. The straps are completely adjustable, so just about any sized individual can take advantage of everything that this pack has to offer. Adjust the straps until you find a comfortable fit and you can literally wear this backpack all day long. With adjustments for adults and children just about anyone can utilize this amazing pack. Along with this, the pack comes along with a handy shoulder harness, so that you can actually strap the pack to your body. Not only does this provide more stability for running, jogging, or climbing, but also it ensures that your belongings stay safe and stable at all times. Whether you find yourself on a smooth trail or on the side of a rugged mountain this pack will offer you the stability and safekeeping that you need to get through your trek. Not every individual out there has the same preferences, likes, and dislikes. Some individuals are partial to the color red, while others might like black. Whatever the situation is, it really won’t make a difference with the Salomon Trail 20 Backpack. This pack is available is black/red or solid red. This gives users to unique and versatile options to choose from. There is a slight price increase with the black/red model, but it is hardly noticeable and if these are your colors of choice it will be worth the extra splurge. Whether you find yourself on a rugged trail or on a mountaintop the weather is something that you can never truly predict. Sure, you can listen to the weather reports and read the latest forecasts, but you truly never know how the weather is going to play out. That is why this backpack was designed with extreme weather in mind. Thanks to the waterproof design it doesn’t matter if you find yourself amid a typhoon or in the middle of a river, this pack will be able to stand up to the harsh environment, while keeping your belonging safe. Some people like to venture into the wild at night, while others likes heading out early in the morning. Whatever your preference is, there is always a good chance that you might get caught out when the sun in just setting or going down. This can make it incredibly hard for passing cars and trail vehicles to spot you. 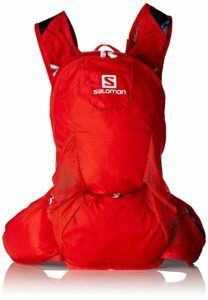 However, with the Salomon Trail 20 Backpack this won’t be a problem with the unique reflective design. Regardless, of the time of day or night the reflective design of this pack will always ensure that you are seen. Mother nature is a beautiful thing, but to ensure that it stays this way people really need to take care of it. No one wants to walk on a trail that is covered and littered with trash and candy wrappers. That is exactly why this pack comes along with a handy trash pocket. If you find yourself eating a quick lunch on the trail, you will always have a safe and secure place to store your garbage, so you don’t have to litter. When traveling by foot, your body will begin to heat up within 30 to 45 minutes. With this said, your body heat will cause your backpack and the items stored inside it to heat up, as well. 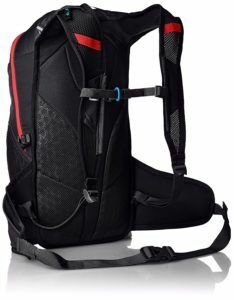 To ensure your items say cool and dry throughout your trip, Salomon integrated the Trail 20 with a superior air vent system,we need to note that this is sport type backpack,this is not case with standard types of backpacks. The air will flow freely throughout the backpack, even when the temperature and humidity is at its highest point. 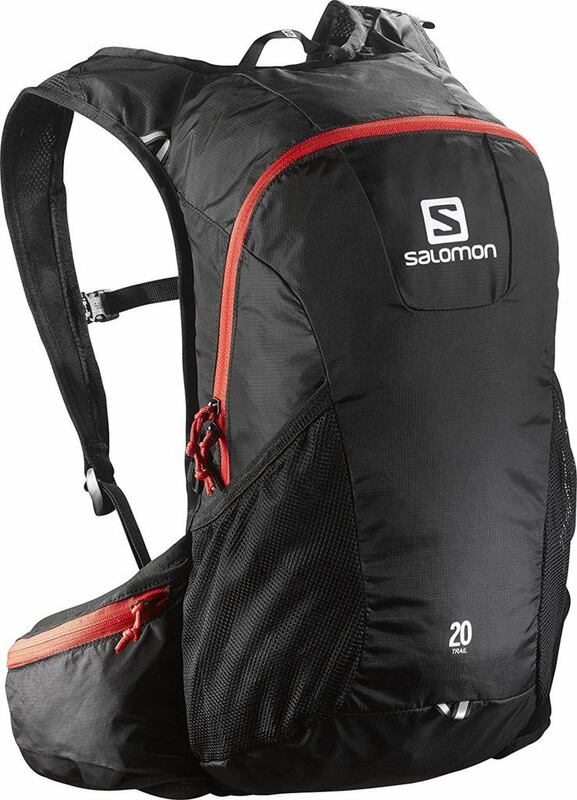 The Salomon Trail 20 Backpack is ideal for active runners, hikers and walkers. The harness is adjustable so you can create the perfect fit in seconds. The backpack is extremely easy to put on and take off. Keeps items dry and cool during long outdoor adventures.